Hormones are chemical mediators that control and regulate the entire mechanism of the body throughout an individual's lifespan. These hormones are secreted by specific ductless glands spread across various organs of the body. The pituitary gland or hypophysis regulates the hormonal secretions and controls the growth, development, secretions and functioning of other endocrine glands, for example, adrenal glands. This small endocrine gland has got a pea-sized body and is found at the base of brain in the skull cavity lying below the controlling organ, called hypothalamus. Owing to its large impact on the body, pituitary is also known as the “master gland”. Structurally, it can be distinguished into three distinct parts, namely, anterior lobe, the intermediate lobe and posterior lobe. Each lobe has got a different set of functions based on the hormones it synthesizes. The regulation of growth, reproduction, lactation and stress falls under the domain of the anterior pituitary. The intermediate lobe is concerned with the synthesis and secretion of melanocyte-stimulating hormone. Turning to the posterior lobe, it is functionally connected with the hypothalamus. Measuring about the size of a pea, this pink-colored hormone secreting organ measures 5 grams in weight, and is located in the folds of brain. 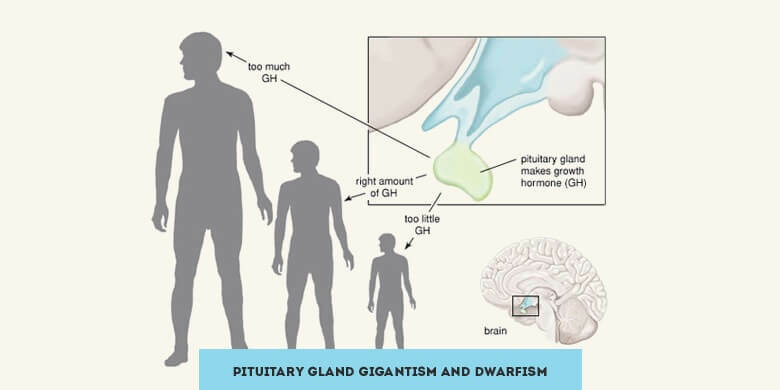 The height, shape and size of an individual is greatly influenced by the activity of pituitary gland. The excessive secretion of growth hormone leads to increased height and its decreased secretion results in dwarfism. Pituitary gland is called the king of all glands (or master gland) as it controls them all and is in-turn controlled by the Hypothalamus. It is pituitary that serves as the center of sexuality and reproduction in your body. In other words, the secretions of the posterior lobe of the pituitary are responsible for child birth and sexual life of an individual. Though many other parts of the body are actively involved in sexual processes, this gland enjoys a prominent position because it initiates all such processes. Do you know around 30 to 40% percent of population suffers from sexual dysfunction at some time in life? It is because of the malfunctioning of the pituitary gland. A connection is built between endocrine and nervous systems through hypophysis (an alternative term to denote hypothalamus). The very reason why humans remain hale and healthy with fast healing and recovery phases in the first 50 years of their lifespan is that pituitary gland functions very best for about 50 years. The gland hangs from a part of the brain called the hypothalamus and is connected with the same through a small stalk called the infundibulum. The hypophysis generates and releases nine hormones, in total, into the blood stream which mainly serve to maintain homeostasis in the body. Having its origin in the pituitary gland, the Cushing’s disease is a deadly condition that is very difficult to diagnose and treat. Cortisol or ACTH is a life hormone that is regulated by the pituitary. We would soon die in the absence of this hormone! The pituitary and the thyroid gland are interconnected, rather dependent on each other, for their normal functioning. This important fact is often overlooked by the doctors while dealing with hormonal diseases. The amount of food you eat is determined by the pituitary secretions. It is because the regulation of metabolic processes falls under the domain of this gland. Also the diseases like bulimia and anorexia have their origin in the pituitary. This master gland also serves as a place for the origin and regulation of lots of mental and emotional processes, including mood and behavior. The regulation of menstrual cycles, opening of the birth canal as well as the secretion of breast milk are the functions to be accomplished by this gland. Various pituitary hormones are responsible for a number of vital processes in the body, like maintenance of homeostasis, growth, metabolism, sexuality, reproduction, mood, behavior and so on. Major diseases of the pituitary gland are characterized by either hypersecretion (overproduction) or hypo-secretion (underproduction) of hormones. It may result from a number of underlying factors including tumor development and impaired blood supply to the gland. Some of the major disorders of pituitary gland are listed here along with their relation to specific hormones. The tumors may be either cancerous or non-cancerous (benign). However, in the majority of the cases, these are benign. Such a condition gives rise to the deficiency or over production of any one or all of the Pituitary Hormones. As the hormones secreted by this pea-sized organ are used to regulate very critical body organs and glands, their under- or overproduction is sure to affect dozens of vital bodily functions and processes. Sometimes, it may also happen that even after the development of a tumor the affected gland continues working normally. According to the findings of the American Cancer Society, pituitary cancer is very rare and mostly older people fall victim to it. The choice of and appropriate treatment measure depends on the size, stage and nature of the tumor. Surgical removal may also be suggested in more severe cases. Characterized by the hyper-secretion of GH (Growth Hormone), this rare condition results in the excessive growth of bone and organ. The organs like arms, face, feet and legs are more likely to be affected by it. This condition arises from the development of a benign tumor. If left untreated, the condition of acromegaly can also prove to be life-threatening. Its timely treatment, on the other hand, enables the victim lead a normal and healthy life. After its diagnosis through blood tests and imaging studies, your healthcare provider may choose from among medication, surgery and radiation as a treatment measure as deemed appropriate. A short form for Growth Hormone Deficiency, GHD is characterized by the hypo-secretion of the growth hormone. Children are more often affected by this hormonal disease than adults. It is good to know that only one child out of 7,000 births is found affected with it. If a child is not meeting the standards of height and weight, it should be a point of concern for the parents. The condition is easily treatable, but if left untreated, this disorder results in delayed puberty and shorter-than-average height. Various psychological symptoms, like poor memory, depression, lack of concentration and bouts of anxiety has also been found associated with GHD. Synthetic growth hormones have been used to successfully treat this condition since the mid-1980s. This disease is caused by the hypo-secretion of vasopressin, a pituitary hormone responsible for the control and regulation of kidney function. As a result of this condition, the affected person has to face excessive thirst and excrete severely dilute urine. As there are further different types of DI (diabetes insipidus), the suggestion of appropriate treatment measure depends upon the kind and severity of the disorder. Hyper-secretion of adrenocorticotropic hormone or cortisol in the body results in the onset of Cushing’s disease. Individuals making overuse of corticosteroid medications are more likely to suffer from it. Upper body weight gain, easy bruising of skin, obesity, fatigue and round shaped skin are some of the symptoms which can be relieved by the use of medications or surgery. If less-than-normal secretion of vasopressin or antidiuretic hormone is the cause of diabetes insipidus, the abnormally high production of this biologically important substance is also problematic. The abnormal production of ADH is triggered by cancer. Seizures, restlessness, loss of appetite and confusion are some of the symptoms. The treatment involves the use of medications that can reduce the fluid retention to avoid further buildup. A type of hypopituitarism, Sheehan’s syndrome is characterized by the permanent underproduction of essential hormones of the pituitary. The condition is associated with childbirth and affects the women who lose excessive amount of blood while giving birth to a baby. Though rare in the industrialized countries, this condition is still a great threat to women in the less developed nations. The hormone replacement therapy has proved to be effective in the treatment of this disorder. 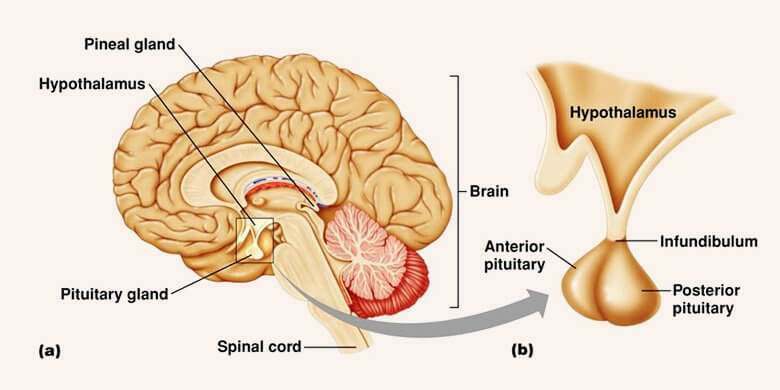 While Sheehan’s syndrome involved the underproduction of pituitary hormones, hyperpituitarism is characterized by hyper-secretion of any pituitary hormone. This condition occurs specifically when the pituitary gland produces too much amount of growth hormone. In adults, it is known as acromegaly while in children hyperpituitarism is termed as gigantism. Different treatment measures include radiation, hormone replacement therapy, medication and surgical removal of the underlying tumor.